CREATE brings together our mission in furthering Human-Robot Interaction with our desire to disruptively redefine how communities can make sense of their context through the use of robotic technologies. We include both research projects studying robot programming and curriculum design projects for teaching robot programming at the secondary school level and beyond. Topics of interest in the lab include: formal representations of perception and action; learning and planning with incomplete information; interleaving planning and execution; mobile robot architectures; real-time visual obstacle avoidance and navigation; robot team communication and cooperation; robotics for the handicapped. 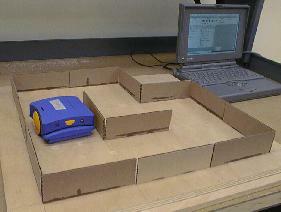 The CREATE Lab is also the home lab of the Toy Robots Initiative. This initiative aims to commercialize robotics technologies for education and toy entertainment. The goal is to produce a robot wheelchair capable of navigating Carnegie Mellon's campus, traveling from my office to the Campus Bookstore to fetch a book autonomously. To this end, this project encompasses challenges in vision, navigation, learning, obstacle avoidance in a dynamic world and planning with incomplete information. 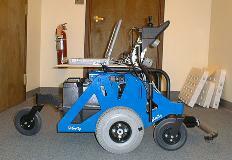 The project uses a robot chassis that is actually an electric wheelchair! Localization and sidewalk-following will be performed exclusively using passive vision. For an informal discussion of vision and navigation, see the Monologue on Navigation. For a one-page description of this project, click here. We are working with Hyperbot, a company in California devoted to educational robotics, to develop both physical robots and curriculum that will make educational robotics viable at the middle school and high school levels. 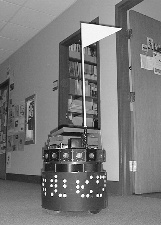 The robot, CHiP, has just been announced (see the picture). The curriculum will leverage robot programming in order to aid teachers in bringing together math, physics, team skills and of course computer science. If you like innovative education, you should also see what goes on at Berkeley. Would you like to see an experimental version of our curriculum? Click here! On the formal side, our work revolves around the concepts of hierarchy and abstraction. These are crucial terms in making the complex, dynamic real-world tractable for present processing systems. Three directions of research occupy this category: (1) The study of hierarchical robot architecture, including the formal specification and analysis of autonomous systems; (2) Communication and cooperation between heterogeneous autonomous systems, including reasoning about the intention of fellow robots and cooperation with minimal communication; and (3) Unsupervised learning of natural hierarchy and abstraction through world interaction. You can download a working paper on Abstraction, Using Abstraction to Interleave Planning and Execution. We feel it is possible to find ways to apply abstraction and hierarchy to robots by understanding how humans reason with these concepts. To achieve this, we are developing a Representation Designer. The goal is to design a generic graphical tool that will allow human users to define a representation of the world and test it with planning and diagnosis problems. This representation will incorporate objects, actions, goals, time and the relationships between these entities. If you tell the robot that you're going to a lab meeting at 4:00, it calls you at 3:00 at home to remind you to go to CMU and brings your lab notebook to the meeting for you. Click here to see a screen shot from the current working interface! For forty years, computer scientists have had the field of Computer Architecture to provide a framework in which to describe their work. A new system or piece of hardware can be described in terms of well defined terms and relationships. In order to describe the internal workings of a robot, however, people have to resort to extensive sketches, ad hoc descriptions and artistic hand gestures. We are grabbing robotics by its roots in Computer Science, Control Systems, Electrical Engineering and other fields, and constructing a formal descriptive and analytic methodology. We are applying the principles from already established formalisms including Real-Time Multimedia Systems, Feedback Control Theory, Petri Net Theory, Computer Architecture, and apply them to the subfields of robotics, ranging from Intelligent Agents down through Actuator Control. In order to allow robot learners to solve more complex problems with a minimum of human intervention, we are developing a system that automatically generates a hierarchy of behaviors, useful subtasks, and abstractions from real-world experience. The system uses a model of attention to choose subgoals and guide exploration such that creating abstractions is easier. David Andre is a PhD student at UC Berkeley. He is here as a visiting scholar for this semester only and is focusing his efforts on learning abstraction hierarchies. Sal Desiano is a Robotics PhD student at the Robotics Institute and is concentrating on the holy grail of Robot Architecture. Carlos Guestrin is a visitor at the Robotics Institute and is focusing on the Representation Designer project and Educational Robotics. Carlos is also involved in Visual Position Estimation research. Illah R. Nourbakhsh is Assistant Professor of Robotics at the Robotics Institute. He runs the Mobile Robot Programming Lab and is also a member of the Automated Highway System project. Iwan Ulrich is a Robotics PhD student at the Robotics Institute and leads the Bookstore Project.